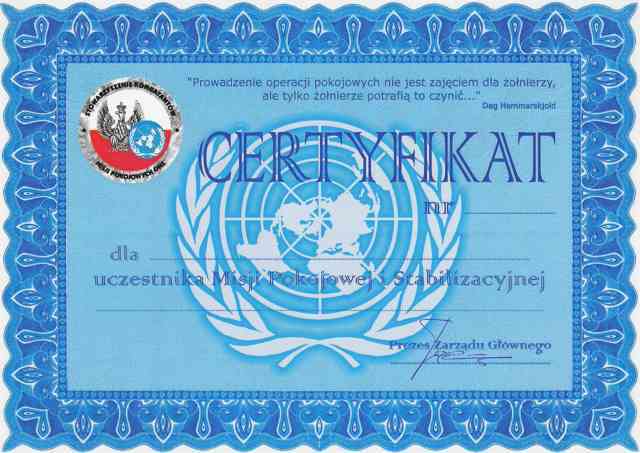 "Peace Mission's certificate and Stabilisation"
Certificate bears the serial number of the next , has a place to enter a military rank and property, and the names of participants and the area performing a peacekeeping mission or stabilization or all of the dates and places of service. The document bears the stamp of the Board and signed by the President. The certificate is awarded only to participants peacekeeping or stabilization and should not be treated as the occasional award for members of other associations, institutions or individuals. Decyzją Zarządu Głównego całością spraw związanych z ewidencją i dystrybucja w/w dokumentu zajmuje się wiceprezes Z.G. arm. Richard KELLER / Branch No. 1 in Bydgoszcz /. Arm. Keller was given the task of proper documentation and accurate records of certificates granted, provide the necessary information in order to properly fill and care, together with the treasurer about financial security kol.Sąsiadkiem. Koszt certyfikatu pokrywany jest z funduszy Koła terenowego SKMP ONZ. Board undertook to inform Prezydim kol.R.Kellera ZG. Board meeting and for each request of the President of the process of granting a commemorative certificate to members of the Association of. Along with the documents / certificates / information will be sent to fill in the document and the order numbers of the relevant annex the registration and accounting rules.